I can’t believe that I used to hate bell pepper! When I was a kid, I even told people I’d be allergic to them, just so I didn’t have to eat them. Haha! Crazy me, I know! It’s so weird how your taste buds can change over time. Today, I absolutely LOVE red bell pepper and we eat them all the time. Either raw with hummus, grilled with zucchini and potatoes, or in a salad. And I also love stuffed bell peppers. Bell peppers are super healthy and very good for you. They’re packed with vitamin c and folate. Besides, they also contain a good amount of vitamins A and E. So they’re perfect for a healthy diet. You don’t need many ingredients for this vegan roasted red pepper pasta. It’s all pretty easy. As always, you can find the full ingredient list and recipe instructions in a separate, printable recipe box underneath the text section. The recipe is basically divided into two parts. First cut the red bell pepper and the onion into stripes. Together with the garlic, place them on a baking sheet lined with parchment paper and bake for 10 minutes. Then place them in a high speed blender together with the remaining ingredients and process until smooth. Pretty easy, right? Pour the red bell pepper sauce into a saucepan and heat it up for a couple of minutes. The nutritional yeast make the sauce suuuuper creamy! Serve the roasted red pepper sauce with fettuccine or pasta of your choice and you got a healthy and comforting meal. I love making this vegan roasted red pepper pasta on busy weeknight days. It’s just SO easy! I hope you like this recipe as much as we do around here! You might also wanna check out my vegan Alfredo with fettuccine. Preheat the oven to 350 °F. Cut the red bell peppers and the onion into stripes. 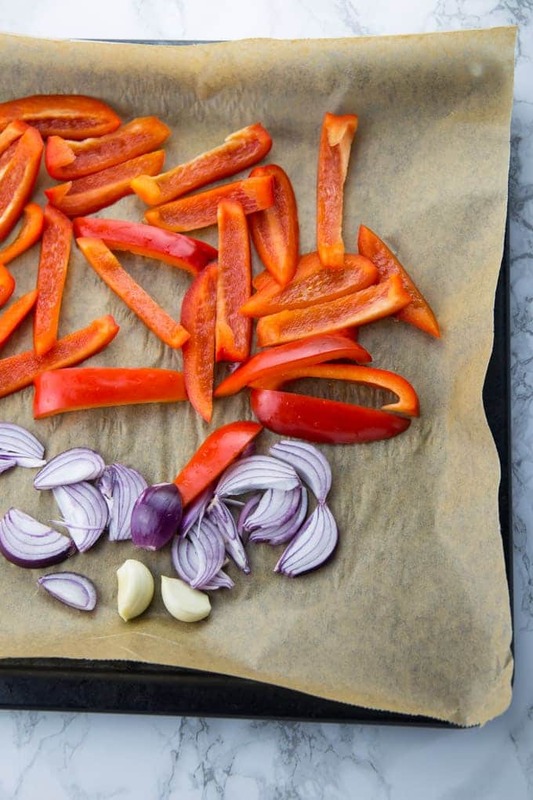 Together with the garlic, place them on a baking sheet lined with parchment paper and bake for 10 minutes. In the meantime, cook the fettuccine according to the instructions on the package. Set aside. Get the bell pepper, the onion, and the garlic out of the oven and place them in a high speed blender together with the remaining ingredients and process until smooth. Pour the red bell pepper sauce into a saucepan and heat it up for a couple of minutes. Stir in the cooked fettuccine and serve immediately. Sprinkle with fresh chopped parsley and more red pepper flakes if you like. Enjoy! We loved the recipe! We adjusted a bit to make use of things we already had at home (peanuts instead of cashews, regular milk and a bit of soft cheese instead of nutritional yeast) and left out the onion, but I really have to say the recipe was soooo good. Super quick to make and with 1,5 times the ingredients we were able to eat it for three meals each! It tasted just as good warmed up again and as it’s quite healthy, cheap and fast we’ll surely make it more often. We’re looking to see if we can even incorporate the sauce in other dishes like lasagne. Adding Milk and Cheese ARE NOT VEGAN! Hi! Do the cashews need to soak in water at all beforehand? I would recommend soaking the cashews before blending. Pour boiling water on the cashews and let soak for 2hrs or soak over night (or while at work) with room temp water; It’ll make the cream much smoother rather than blending raw. Where are the instructions for the sauce? Nothing like a bowl of pasta in the winter months. Thanks for sharing this recipe. Going to pin it for later! Should you cook the onions, pepper and garlic for longer than 10 minutes? The garlic is very raw. I upped the temp to 450 and added more time. I hope it doesn’t altar the taste of the sauce too much. Made this sauce and we absolutely loved it! So easy and full of flavor. I didn’t have fettuccine so I served it with spaghetti. I also doubled the paprika powder! Yummy! Thanks for the amazing recipe!! Very easy, extremely good!! I omitted red pepper flakes and went heavier on garlic and smoked paprika. Amazingly good!! Sounds delicious! I have 3 in my fridge! Thanks for the recipe! Could I make two batches and freeze this? Hi, can I freeze the sauce? Delicious! I added mushrooms and chopped orange peppers that needed to be used. Very creamy and flavorful! I’ll make this one again! I really liked this recipe. As a short-cut I used 2 jars of fire roasted red peppers. Added more Nutritional yeast than recipe called for and then added a jar of Pesto sauce. It was great. Awesome recipe! Came together so quick and was delicious. Definitely going to become a go-to. I added a cup of fresh baby spinach the needed to be used at the very end when I was combining the pasta with the sauce and it was a great addition. Wow! This is AMAZING! A new favorite for sure. I followed the recipe exactly only omitting nutritional yeast and exchanging with potato starch to thicken. I served with 12 ounces Gluten Free spaghetti noodles.